Thank you to Ruth Ayres at Discover. Play. Build. She hosts a link-up every week that focuses on the reasons we have to celebrate. This week I am celebrating excitement about books. After spending the first month of school administering literacy assessments, I have finally started working with small groups of students to provide reading support. One of my goals this year is to spread the love of books and motivate my students to read more in school and at home. I plan to do this by seeking out books I think will interest and excite my students. I also want to give book talks more often. In addition, I have been looking for book trailers and videos of authors discussing their books. 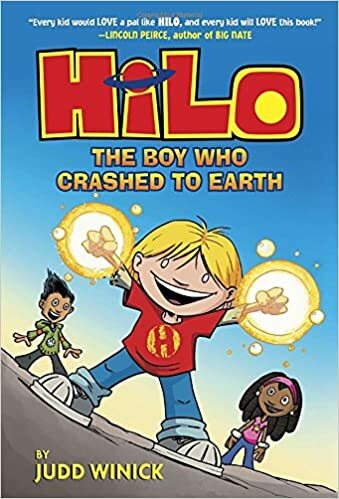 I recently read Hilo: The Boy Who Crashed to Earth. This is a graphic novel and by the time I had read the first few pages I knew it was a book my students would love to read. Through searching YouTube I found a short video of the author, Judd Winick, discussing what the book is about. I played the video for a group of my students and they were absolutely hooked. When I asked who wanted to borrow the book all hands were immediately in the air. I thought one student was going to climb over the table to grab the book out of my hands. As I explained how I was going to fairly decide who could borrow the book, one student argued, “But I raised my hand first.” I gave out the book and shortly had a student begging to borrow the second copy. I appeased the rest of the students by putting their names on a “waiting list.” As a reading teacher and book lover, I am overjoyed when I see such excitement about a book. It’s not always easy to hook students on a book, but when it happens it is definitely reason to celebrate. I have this book on my list to read! I can feel your excitement about it!! So glad your students are enjoying it too!! (I remember the author from the early days of the Real World on MTV!!) Thank you for sharing! I just love books that have wide appeal like this. I also remember the author from The Real World and from his terrific graphic novel memoir for older readers, Pedro & Me. I didn't know the author was on The Real World. I actually didn't know who he was until I picked up this book. Your writing just fills up with excitement from the book, and for the students' enthusiasm. I have the book on my "long" list, but will move it up! It's a very quick read. I really enjoyed this book too - it is such an appealing title! So wonderful that the students are so excited. I wish the second one was being published sooner since the students love it so much, but I don't think it's until May. I have heard so much about this book, and graphic novels are hit at any grade level I think. When students "fight" over books makes it even better! It's funny, there's action, lots of pictures because it 's a graphic novel...many of the things that appeal to kids. I'm glad I stumbled upon your blog. I am a reading specialist for students in grades 4-6. It is a great celebration when the assessments are complete and we can move into actually reading! I'm glad you stumbled on it as well! It definitely is nice to finish with assessments and actually work with students. Sharing books with students and having discussions about the books we're reading is definitely more fun than the assessments!